Our puppies are born in our home and as they grow they get to venture to various rooms and the great outdoors for fun and activity. All of our puppies get a lot of daily attention. Our puppies go to their new homes between 8-9 weeks of age. The puppies have been socialized with children, adults, our dogs, and cats. 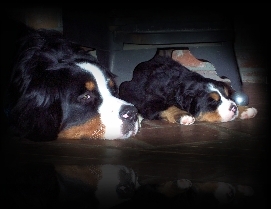 The puppies get exposed to many surfaces, toys, and sounds. When you bring your puppy home you will need to continue socializing, meeting/greeting new people and animals to continue their proper development. Anyone interested in one of our puppies please fill out our puppy questionnaire. Our puppies are sold as Pet/Companion puppies placed on Limited Registration with AKC. I provide written contracts/health guarantee's, and copies of ALL health screenings. Our puppies are required to be spayed/neutered by one year of age.